In fall 2017, qualified first-year Chicago-Kent students will be able to take upper-level elective courses in Patent Law or Copyright Law in their first semester of law school. The pilot program is an expansion of the school's highly successful 1L Your Way program, which gives first-year students the option to take, in their second semester, an upper-level elective with second- and third-year students. 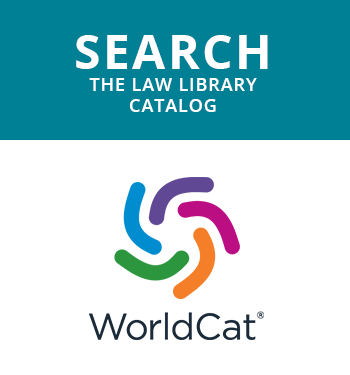 The 1L Your Way program has been popular among first-year students, and it has better prepared them for their summer jobs by allowing them to study a course in an area of law that they might specialize in. The pilot program to expand 1L Your Way to the first semester is a part of the school's nationally recognized Program in Intellectual Property Law. The change was initiated after careful study of the performance of first-year students in IP and other upper-level elective courses in the past two years. 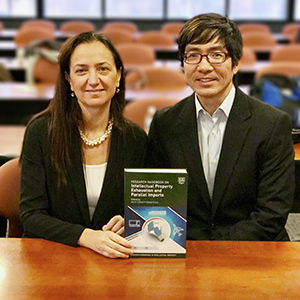 "By all indications, the 1L Your Way program of Chicago-Kent has been a huge success, particularly with intellectual property electives," said Professor Edward Lee, the director of the IP Program. "The results show that first-year students are more motivated and engaged in classes they choose—which has translated into better performance. 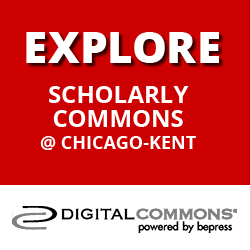 Chicago-Kent has always aspired to be at the vanguard of intellectual property instruction. We believe offering 1Ls IP courses in the fall semester is the next step to offering the highest quality education in IP." To participate in the pilot program, first-year students will be required to take and successfully complete the early-start, first-year course generally available to all first-year students at Chicago-Kent. Early-start 1L students can then apply to enroll in an upper-level Patent Law or Copyright Law course in fall 2017. 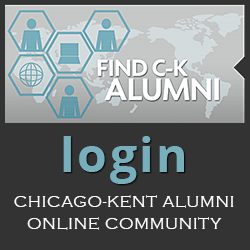 Dean Harold Krent said, "Chicago-Kent has long been a leader in education related to law, technology and intellectual property. This bold move to offer IP courses to 1Ls in the first semester of law school is in keeping with the law school's history—and mission." From left: Catherine Larson, Meaghan Fontein and Francyn Brown finished fourth nationally at the 2017 Saul Lefkowitz Moot Court Competition. 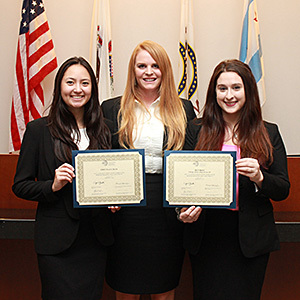 The Chicago-Kent appellate advocacy team of Francyn Brown '18, Meaghan Fontein '18 and Catherine Larson '17 won the Midwest regional tournament of the Saul Lefkowitz Moot Court Competition and finished fourth overall in the national finals. To win the Midwest regional competition, the team prevailed over Michigan State University College of Law and the University of Iowa College of Law. They were also honored with the regional competition's best brief award. In March, the team traveled to Washington, D.C., for the national round held at the U.S. Court of Appeals for the Federal Circuit. There, they argued against George Mason University School of Law and the University of Oklahoma College of Law before a panel that included judges from the USPTO's Trademark Trial and Appeal Board. Chicago-Kent finished fourth overall. Their brief was ranked third nationally, and their oral argument was ranked sixth nationally. This is the third time in the past four years that a team from Chicago-Kent has placed in the top four in the national competition. The team was coached by Chicago-Kent alumna Ashly I. Boesche '04, a partner at Pattishall McAuliffe, with help from Professor Mickie Piatt, Professor Kent Streseman and alumni Sarah Aagaard '14, Stephanie Crigler '16, Eliot Gusdorf '16 and Kenneth Matuszewski '16. The 9th annual Trademark Scholars Roundtable, held at Chicago-Kent, included leading trademark scholars from the United States and abroad. In March, Chicago-Kent hosted the 9th annual Trademark Scholars Roundtable, which convenes leading trademark scholars from the United States and abroad. The two-day conference focused on issues related to meaning and tests of distinctiveness (including secondary meaning) and the relevance of fame, reputation and well-known-marks. 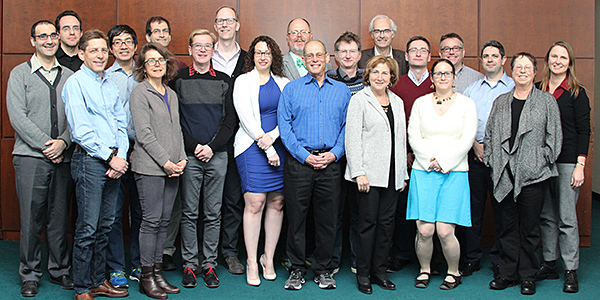 Twenty scholars participated in this year's roundtable, which was organized by Professor Graeme Dinwoodie, who returned to Chicago-Kent this past year in a joint appointment with Oxford University, where he still teaches. "It was wonderful to convene the Trademark Scholars Roundtable the first semester back at Chicago-Kent. 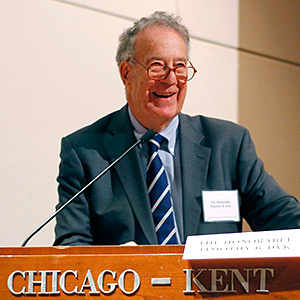 I could not think of a better way to reacquaint myself with the Chicago academic scene than to bring together some of the finest trademark scholars to discuss trademark law," remarked Professor Dinwoodie. 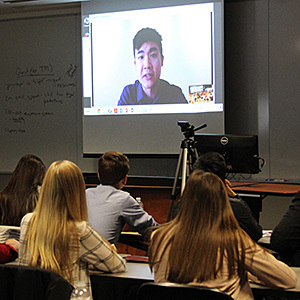 Simon Tam, founder of the Slants and respondent in the Supreme Court case Lee v. Tam, spoke via Skype at an event held in March at Chicago-Kent to teach local high school students about the Supreme Court. Can the U.S. Patent and Trademark Office (USPTO) deny registration of a trademark because the USPTO believes the mark in question "may disparage … persons" under Section 2(a) of the Lanham Act? In Lee v. Tam, the federal government is seeking the reversal of a Federal Circuit decision, which held that Section 2(a)'s bar against registration of so-called disparaging marks violated the First Amendment. The decision is a rare instance—and perhaps the only instance—in which a federal court of appeals found a federal IP law to have violated the freedom of speech. The case was brought by Simon Tam, a member of the Asian-American band named "The Slants." Tam and the other members of the band are Asian Americans. They chose their band name to reclaim a word that had historically been used as a slur against people of Asian descent. The USPTO denied Tam's application to register the band's name because the office found that the term may disparage persons of Asian descent. On appeal, the Federal Circuit eventually ruled en banc that the Lanham Act's Section 2(a) bar against "disparaging" marks constituted viewpoint discrimination in violation of the First Amendment. Professor Edward Lee filed an amici brief with Professor Jake Linford of Florida State University College of Law in support of Tam and the Federal Circuit's decision. Why did you get involved in the case? I almost didn't. It's a tough case, and, for a good time, I went back and forth on the issue. But when would the next First Amendment intellectual property case involving issues related to the Asian-American community come around? As an Asian-American professor who writes about the First Amendment and IP law, I felt almost compelled to write something. When I worked at the Supreme Court group at Mayer Brown in D.C., I learned that an effective amicus brief doesn't repeat the arguments of the parties—that would be a waste of the Court's time. In the brief, we give the Supreme Court an alternative path to affirm the Federal Circuit's decision that no one else was arguing. I picked the line of reasoning of the dissent in the Texas specialty license plate case (Walker v. Texas Division, Sons of Confederate Veterans, Inc., 135 S. Ct. 2239 (2015))—the limited public forum doctrine. With four justices already adopting that approach in Walker, I thought that the same approach might persuade the same justices (except for Justice Scalia, who has since passed away). We argue that federal trademark registration constitutes a limited public forum—akin to a public bulletin board for trademark owners to post their information—and that the Section 2(a) bar constitutes viewpoint discrimination. That would be foolish. But, for some reason, I have an odd feeling that it could be 4-4 and then scheduled for reargument this fall with Justice Gorsuch. We'll see. 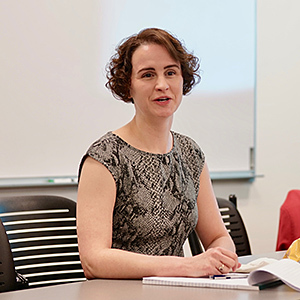 University of Oklahoma College of Law Professor Sarah Burstein spoke about the evolving understanding of design in design patent law. In February, Chicago-Kent hosted a working luncheon for IP scholars in Chicago to launch the Chicago IP Scholars Works in Progress (CHIPSWIP) series. The series will rotate between Loyola, Northwestern, and other Chicago law schools during the year, so local professors can share their works in progress. At the luncheon, Chicago-Kent Professor Greg Reilly and University of Oklahoma College of Law Professor Sarah Burstein presented early-stage article ideas to a group of professors. 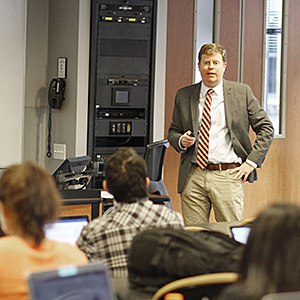 Professor Reilly spoke about the expansion of Patent Office procedures and decisionmaking under the America Invents Act, while Professor Burstein spoke about the evolving understanding of design in design patent law. Professor David Schwartz of Northwestern Pritzker School of Law discussed his paper An Empirical Analysis of the Patent Litigation Process. 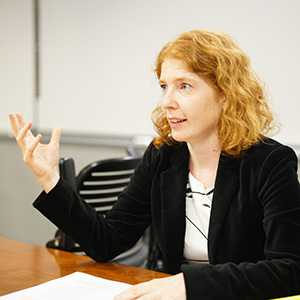 Professor Sarah Rajec of William & Mary Law School discussed her paper In Rem in IP at the Chicago IP Colloquium. Chicago-Kent College of Law and Loyola University Chicago School of Law jointly host the Chicago Intellectual Property Colloquium. The colloquium promotes the discussion of a range of issues in intellectual property as a part of a course taken by students at Chicago-Kent and Loyola. 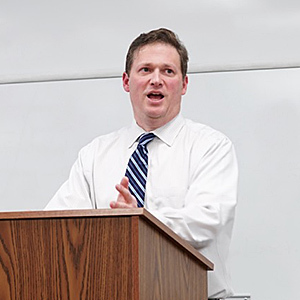 The students offer their reaction, criticisms and questions to each speaker during the semester. Judge Timothy B. Dyk gave the keynote speech at Chicago-Kent's 2016 Supreme Court Intellectual Property Review. On September 22, 2016, Chicago-Kent proudly hosted the Supreme Court Intellectual Property Review. The Honorable Timothy B. Dyk of the U.S. Court of Appeals for the Federal Circuit delivered the keynote speech, which was recently published in a symposium issue of the Chicago-Kent Journal of Intellectual Property. The journal invited several prominent academics and professionals to write formal responses to Judge Dyk's article for inclusion in the symposium. The symposium features four responses. How Can the Supreme Court Not "Understand" Patent Law? The Supreme Court IP Review (SCIPR) is an annual conference designed to provide intellectual property practitioners, jurists, legal academics and law students with a review of IP cases from the U.S. Supreme Court's previous Term, a preview of cases on the docket for the upcoming Term, and a discussion of cert. petitions to watch. More information will be available on the SCIPR website. The Power of PTAB: The New Authority in Patent Law Conference will examine the rise of the Patent Trial and Appeal Board, which is on pace in 2017 to set a record of deciding over 2,000 inter-partes review (IPR) initiated by parties challenging the validity of existing patents. The public conference will convene leading patent academics and attorneys to examine many facets of the PTAB's expanded powers under the America Invents Act, including related to PTAB procedures, claim construction, and decisions. The conference will facilitate comments for the USPTO's PTAB Procedural Reform initiative and will also generate articles for a symposium issue of the Chicago-Kent Journal of Intellectual Property. The conference is ideal for all patent attorneys.